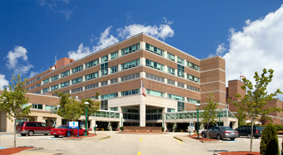 The Elliot Health System, located in Manchester, New Hampshire, is comprised of the Elliot Hospital (a 296 bed acute care facility) in addition to an extensive outpatient network. This outpatient network offers pharmacy residents ambulatory care opportunities, and includes a number of Pediatric and Family Practice offices, in addition to various Specialty Clinics, including Geriatrics, Cardiology, and Endocrinology. The Elliot’s PGY-1 Pharmacy residency program began in 2008 and currently offers two PGY-1 resident positions. The purpose of a PGY1 Pharmacy residency program per the American Society of Health System Pharmacists (ASHP) is to build on Doctor of Pharmacy (Pharm.D.) education and outcomes to contribute to the development of clinical pharmacists responsible for medication-related care of patients with a wide range of conditions, eligible for board certification, and eligible for postgraduate year two (PGY2) pharmacy residency training. There are adequate pharmacist role models for residents who practice routinely in the area for which they precept. Preceptors have committed themselves to teaching the resident using direct instruction, modeling, coaching and facilitating. An adequate practice model environment exists for the learning experience. The PGY-1 Pharmacy residency program at Elliot Health System is accredited by the American Society of Health System Pharmacists (ASHP). The program is affiliated with Massachusetts College of Pharmacy and Health Sciences (MCPHS) in Manchester.